With the year almost over, it seemed interesting to see where weather stations stand in regards to how warm, cold, wet, or dry it has been throughout the year. Here we break down the rain that fell in the United States during the 2018 year. In our first Alphabet Soup piece, we went over GHCN-Daily. This dataset consists of over 100,000 stations globally. About half of those are in the United States alone. NOAAs National Centers for Environmental Information produces a monthly report describing the state of the climate for the country. Here is where rainfall totals stand for the yea as of the end of November. Much of the eastern US has seen above normal precipitation, while the west have seen drier, or below average conditions. These are great maps, but they are only produced at the monthly scale. So the official end of the year reports won’t come out until January. Luckily enough, the underlying data that goes into this product is GHCN-Daily, and that is updated each day with the latest information. So we can dive into the weather station data and take a look at how stations look in regards to rainfall. Has 90% of days reported in 2018. This brings the amount of stations down to 2,300, but still has enough coverage for all 50 states to make an assessment. Below are results, which includes data up to December 7th, 2018.
Who has received the most and least rainfall? Naturally, areas such as Hawaii and Alaska are always going to be the highest, because they always receive a lot of rainfall each year. The first CONUS station to hit the list is Highlands, North Carolina at 6th (110.19”). Typically, this station receives 83.7” of rainfall each year. So if no more rain occurs, this station will be about 131% of normal. With precipitation, it’s usually better to characterize records as percentages, instead of absolutes. This is why I did not show the 5 driest, because they would all be close to zero anyway. This roughly follows the graphic produced by NCEI above. Wetter than normal stations are in the eastern US, and drier are out west. The exception is Ajo, Arizona, who saw about 6” of rain in early October. This put the station from about normal, to nearly twice above normal (180.3%). Below are the precipitation accumulation charts for the wettest and driest station. Parsons, West Virgina has seen a little over 92” of rainfall for the year, and North Island, California about 2.” Numerous stations are above 92” and below 2”, but when we compare these values against it’s other years (including a 30 year average), 2018 sticks out like a sore thumb. 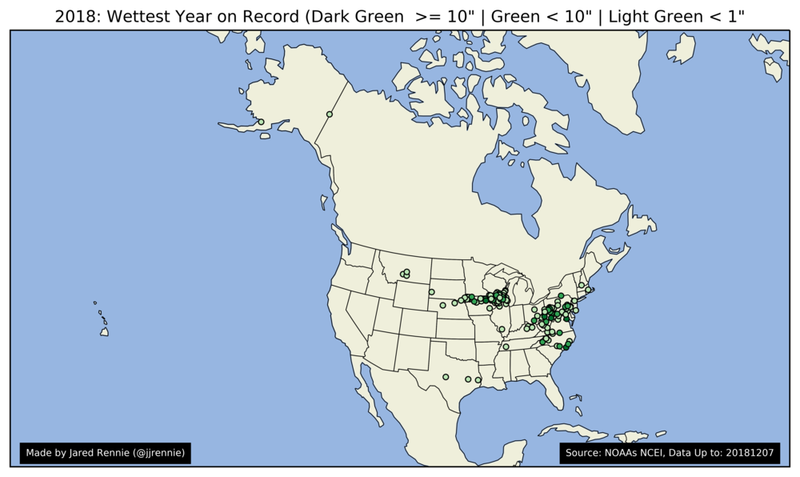 Which stations are already the wettest on record? The Parsons station above has broken the previous record, making 2018 its wettest on record. What’s even more interesting is that it smashed the previous record by about 20 inches! This is one of 127 stations that have already beaten its previous record. They are shown below, and roughly match with the initial graphic NCEI provided at the end of November. Locations are colorized by how far above the previous record it stands. Light green is within an inch, and the darkest green is over 10.” Only two stations are above 20”, Parsons, West Virginia (20.41”), and Wilmington, North Carolina (22.36”). The city was on pace to be the wettest year on record, and then Hurricane Florence guaranteed that, dumping two feet of rain in just a short time. As it stands now. 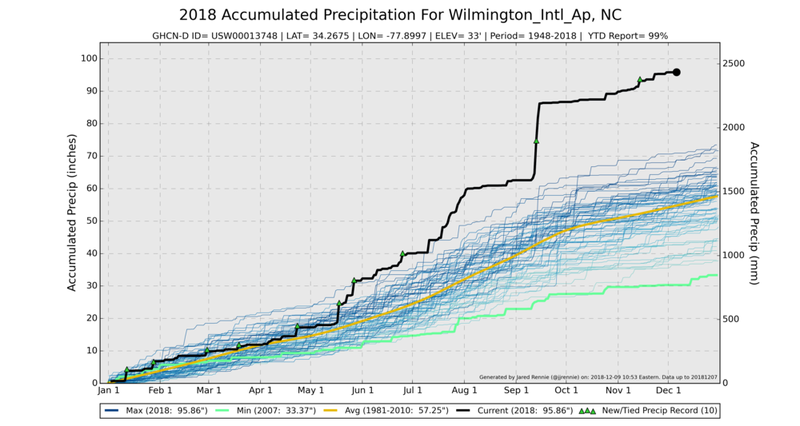 Wilmington is at 95.86” and just needs a little bit more to hit 100". Which stations are close to being records? At the time of writing, there are still a few weeks left to get more rainfall totals. Below are the stations that are close to beating their records. The stations above are within 10” of becoming its wettest year on record. The darker the color, the closer it is to breaking the record. It should be noted the above map is somewhat misleading. While this provides good information for the eastern part of the United States, we can’t say that for the west. Like Hawaii and Alaska with its heavy precipitation, many areas west of the Rockies don’t see a lot of rainfall. In fact, there are 185 stations in the US that on average receive 10” or less in the year. 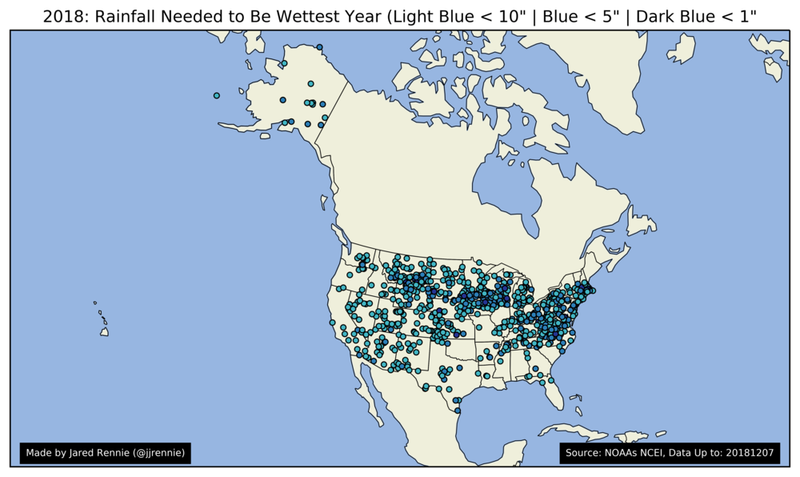 So, technically speaking, these stations will ALWAYS be near it’s wettest year of record. The better way to make this map is by calculating percentages again. This time, we take the “percentage of wettest year” and and plot those that are within 10%. The darker the color, the closer it is to reaching it’s wettest year on record. 207 stations are within 10%, 85 are within 5% and 10 are within 1%. With only a few weeks left, and some heavy precipitation in the forecast. There will be a good chance we see more records broken before the year is out.